Mrs. Nancy J. Walsh Perpetua, of Waltham, died on Thursday October 11, 2018 in her home. She was 67. Nancy was born in Newton on June 17, 1951, a daughter of the late George C. and Mary Elizabeth (Benedict) Walsh. 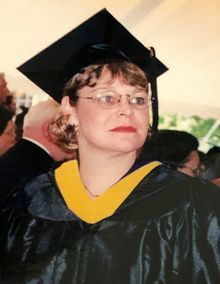 She graduated from Ketcham High School and graduated from Dutchess Community College, Poughkeepsie New York with a degree in nursing. Nancy also graduated from Emmanuel College in Boston. For many years she held several administrative and managerial positions in the healthcare field. She was the wife of the late Joseph E. Perpetua and is survived by her siblings, Mary E. Pass (Joe) of Red Hook, New York, James J. Walsh (late Laura) of Carson, California and Jonathan M. Walsh (Phyllis) of Hopewell Junction, New York. She also leaves her good friend Cynthia Boyle (Cheryl) of Watertown, nieces, nephews, grandnieces and grandnephews. Nancy was the sister of the late George C. Walsh and Kathleen M. Wainwright. Also she was the proud mom to her beloved late dogs Opal and Brandy. In lieu of flowers, we have set up a Memorial fund in Nancy Walsh's name at Best Friends Animal Sanctuary in Kanab, Utah.